So Boris Johnson will not be the next Prime Minister of Britain despite David Cameron handing him a golden ticket on a silver platter – but why has the floppy haired former London mayor stepped aside? Some have argued that Johnson has left the nation to clean up his mess – but maybe he never intended to make it in the first place. Back in May, it was claimed by David Cameron that Boris never truly believed in leaving the European Union – so why campaign for it? Well, in campaigning against a highly unpopular PM, Boris Johnson may well have been strategically maneuvering himself into a position to challenge for the party leadership – but that bid was contingent on not winning the EU referendum and Cameron remaining in power. And that was the narrative Johnson probably expected to play out as Remain looked in a strong position before the polls opened last Thursday. Lose a close run battle, maintain the respect of Brexit voters for his efforts, simultaneously keep up appearances as a lovable buffoon – then swoop in to become PM when the future was clearer. But it did not play out how he wanted and Cameron’s resignation really put the cat among the pigeons, handing Boris a poisoned chalice even he is not daft enough to drink from. In non-political terms it is similar to the situation David Moyes found himself in at Manchester United – there was no way he could outperform the previous act given the tools he was left with. Boris wants to be Jose Mourinho and bring about former glory – in reality, the next PM’s legacy will be that of signing off increased taxation, reducing public spending, while negotiating the murky waters of Brexit and implementing Article 50 of the Lisbon Treaty. So best off leaving that for a figure everyone already hates, like Michael Gove, Theresa May, or the arguably homophobic Stephen Crabb, and playing the long game. 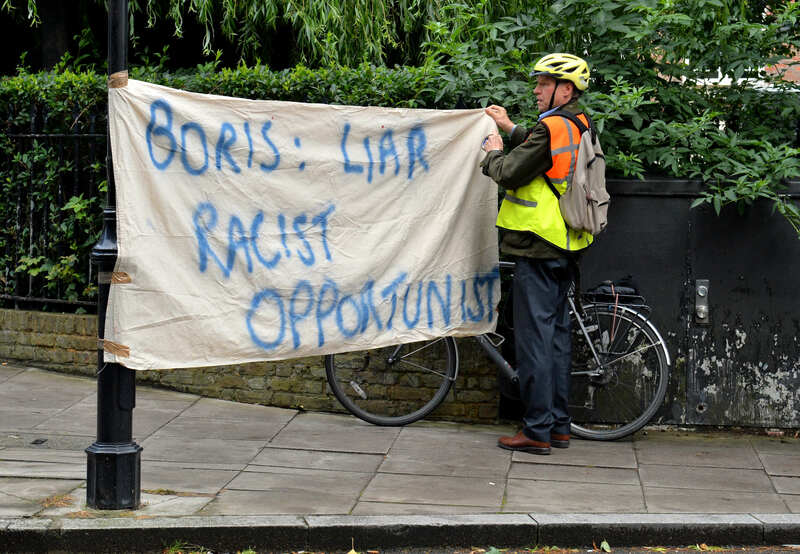 The alternate theory doing the rounds on social media is that Johnson has been forcibly told to rule himself out due to rivals possessing some dirt. Bloody hell – what is it that Michael Gove knows about Boris Johnson?! Conservatives who rode on the coattails of his bizarre popularity perhaps turned on the MP for Uxbridge and South Ruislip, stabbing him in the back once his purpose had been served. Johnson’s own father has spoken out at the disappointment his son won’t enter number ten any time soon. I speak from my heart when I say, that I certainly believed, that Boris would have been the best possible for leader of the [Conservative] party. What matters now is, whoever is the leader of the [Conservative] party, keeps faith with the electorate who voted on June the 23rd. Above all, that means, from my point of view, not doing a deal with the EU which means we cannot control immigration. I’m very, very glad to see that Boris [mentioned it] in his statement, [and] made that absolutely clear. Johnson senior’s statement could even be seen as making a rod for the backs of those who potentially betrayed his New York-born son. In emphasising that whoever steps in now has to secure control of the borders, Stanley Johnson is adding a fresh dose of poison to the chalice, as any deal to enter the single European market will likely hinge on freedom of movement. Johnson has unlikely just abandoned his aims overnight though and in stepping away now, despite disappointing a few, Boris is once again primed to swoop when whoever is elected inevitably fucks up. Whichever way you look at it, Johnson has effectively farted and walked away, leaving Conservatives with the choice of a giant douche, a turd sandwich, and an alleged homophobe.